Everything ranging from the rules to other important "need-to-know" threads are located here. Board rules, missions, currency, systems, etc. are all there for viewing. Please take the time to read the rules (especially) and familiarize yourself with the miscellaneous information. General lists such as Guild Rosters, Magic, etc. are posted here. You can check with them to see if the Face Claim you're thinking of using is open or taken, what kind of characters have already been made (links are provided), or if a certain character is light, neutral, or dark, etc. 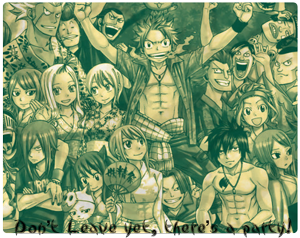 Whether you have a question about the Fairy Tail series, our role play, systems, etc. This is the place to go! We will try to answer and accommodate as best as we can. Guests are also free to post their concerns and questions. All updates and changes to the forum and/or role play will be posted here to let the members know what's going on. This board will also contain polls and the like if something major is going to happen to the site. We will be asking for the members' opinions and thoughts when the time comes. If you need to make changes to your profile, simply fill out the form provided and post a thread asking for changes. We will try and get to you as soon as possible. Interested in spending some EXP that you've earned to build your character? Then this is the place you come, rank ups, tier upgrades and spell slots are sold here. So come and create a badass character. Once you complete a mission, post in here using the template and a staff member will award you and the other thread participants a the amount of jewels your mission was worth. If the mission was completed with obvious haste or a lack of effort, fewer jewels may be awarded. Waterfall city is known as the hidden gem of Fiore. This elegant city is surrounded by hundreds of waterfalls and vast mountains, making it a challenge to travel there. The security of the mountains and the waterfall, leaves the city peaceful and relaxing environment. It's known as the fashion capitol of the world, and a home to one of the most distinguished guilds in the world, The Sirens, a strictly all female guild. Blackwood is the name of a forest located on the far northern part of Fiore, a couple hundred miles east of Waterfall City. It is considered to be one of the most dangerous places in Fiore as many hunters, mages, and travelers seem to disappear within its borders. Rumors say that the living dead call it their home. Magnolia Town is located near the southern border of Fiore. This beautiful city is home to the Fairy Tail Guild. This town has a population of 60,000 inhabitants, and is a merchant city that has been prosperous in Magic since the ancient era. Hargeon is one of the Fiore's ports and also one of its most beautiful old towns, arranged at multiple levels, more prosperous in fishing than Magic. This town is home to The Lamia Scale Guild. Oak is an old castle town. It is situated on a hill, surrounded by forest and mountains with the river flowing nearby. The city is historic, with numerous turrets and battlement. It is located spherical and completely covered hill on which it is located. In the center, towering above the town there is a mighty castle with stone walls as high as the eye can see. Falcon City (also known as the "City of Science") is a large and prosperous merchant city near the Western coast of the Kingdom of Fiore. It is a popular location for merchants and trade companies, often renowned for trading with other countries on a large scale via their airships. Hosenka Town is a town built in an oriental architectural type style. It is considered a "flashy" place. Hosenka houses a number of inns and is known as "The Spa Town", famous for it's hot springs and spa's. The largest and most dangerous mountain in Fiore. It is said to of been home to a dragon once, though no one has seen it's appearance in over a hundred years. At the peek of the mountain are carved three large dragon heads, thus the name Mt. Three Head. Era is a large town, built around the high mountain located in the heart of the city. Before launching Etherion, on this mountain was headquarters of the highest authority in the world of magic - the Magic Council. As it turned out, the mountain did hide the earthly part of the activation mechanism of the Etherion itself. Pelistine City is a city of both, poverty and class. It is sorted among its levels by a simple system. The higher in the city, the more class. The lower, the less. It is a City built in a mountain range split in a cliff. The Lost Pinnacle is home to a tribe of huntsman who are known for their fighting skills and healing magic. It is divided into two sections, the high pinnacle and the low pinnacle. The high pinnacles are where these tribesman call there home, whilst the lower half is known to have deadly carnivorous creatures in which these tribesman hunt. It is also said that an unknown dragon rules these creatures of the bottom half. Crocus is the capital of Fiore and the city where the king lives. It is also the place where the Grand Magic Games take place. Crocus resides in a vast valley surrounded by rocky mountains of small-to-mid height, housing mostly mildly prominent hills, and has a small river not far from it, with some isles in its largest part, flowing in a similarly small gorge, which has woodland on both of its sides, occupying the western zone of the valley. Moriyama is located in the west mountains of Crocus. Like its name suggests Moriyama is a small village surrounded on all sides by a thick, flourishing forest right at the base of a large mountain. There is only one entrance and exit to the town, which is a wide path worn down to simple dirt. This village's main income comes from its agriculture like chopping down the surrounding trees and taking milk from the cows. Bashvarium is a moderate to large floating city. Widely known to be amongst the clouds and sky owned by Grandeeney, this sky fortress is known to of had many visits and discussions with the dragon. Bashvarium is also located not to far from Crocus, essentially mean't to of been built directly above Crocus strong winds have carried it south more. New to the community? Come on in and tell us a little about yourself then so we can get to know you better! Talk about whatever you like right in here! Here you will find old/inactive threads. Please PM Syrena or Eric Cecere if you need a thread returned. This is where you can plug in your site! This is guest-friendly and you don't have to worry about registering or whether we allow certain forum boards. Please post in the appropriate forum & read the rules.